Dashlane has announced a new service aimed at businesses that would allow them to pro-actively warn their customers of a data loss following an intrusion. With hacking hitting headlines week after week, year after year, it seems fairly likely that some of the services that many people use will eventually fall foul of a hack, and certainly individual accounts might. Dashlane is looking to capitalize on this by targeting businesses directly in order to grow its overall user base. 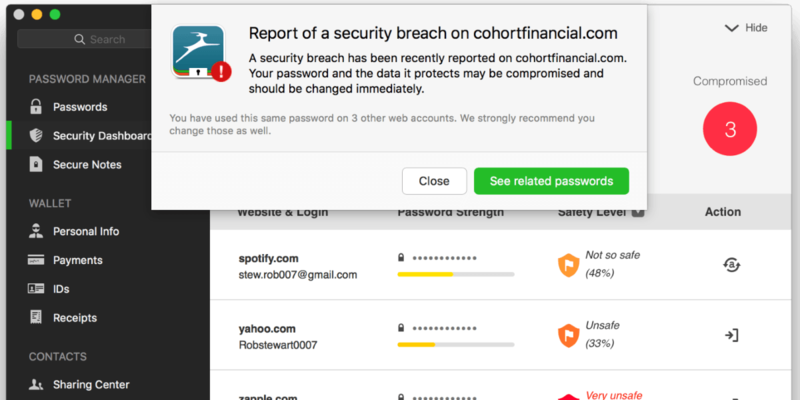 On the user’s side of things, Password Defense Alert sends an notification to the Dashlane app (desktop, mobile and Apple Watch) when the system detects that a company where you have an account has been breached. The value of peace of mind? Of course, that depends on the company in question subscribing to the idea that paying for the breach monitoring and notification system is worthwhile for its own customers. As more and more of our data is stored online, Dashlane’s pretty much banking on it. A spokesperson for the company told TNW that it costs “pennies per user” to inform them of a breach, plus additional fees for optional extras, like a special help center response or custom webpage. It’s also been designed so that your account information on the sites isn’t associated with any of your personally identifiable info or contact details. If an account is breached or deemed ‘at risk’, changing it with the one-click option makes things pretty painless. Dashlane says it’ll be doubling the number of sites that this option supports, from 500 to 1,000, during 2016.